This product helps to keep me regular. The importance of potassium in your diet has long been researched and discussed. Potassium may support cardiovascular and kidney health‚ relieve anxiety‚ increase muscle strength‚ boost metabolism‚ and promote nervous system health. There are plenty of ways to incorporate more potassium into your diet. Good dietary sources of the mineral include bananas‚ salmon‚ chicken‚ whole milk‚ and citrus fruits. However‚ with how hectic work schedules are‚ it's not always easy to eat healthy. So it's possible that these potassium-rich foods aren’t a regular part of your diet. Therefore‚ another way to possibly maintain normal potassium levels is by taking a dietary supplement like Nutri West’s Diu-Plus. Fennel Seed —may provide relief from constipation‚ colic‚ indigestion‚ anemia‚ menstrual pain‚ diarrhea‚ and more. Alfalfa —a plant rich in minerals that may relieve joint pain and stiffness‚ support cardiovascular health‚ and lessen fluid retention. Vitamin B6 —also known as pyrodoxamine‚ it may promote a healthy metabolism‚ treat PMS symptoms‚ and boost immunity. Uva Ursi —Latin for "bear's grape" and sometimes also called Bearberry‚ this botanical may reduce some inflammations while also possibly supporting urinary health. Celery —in addition to its culinary uses‚ this plant can also increase urination and lessen fluid retention. 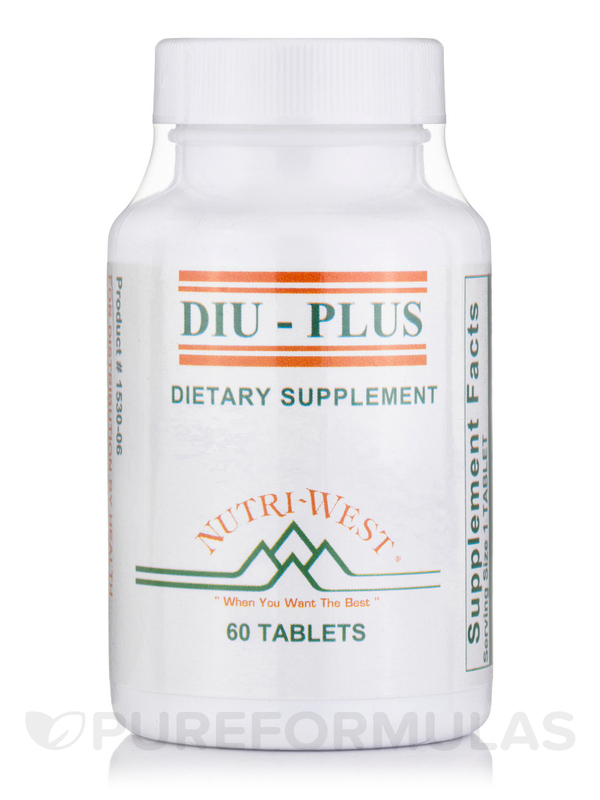 Take one or two tablets of Diu-Plus by Nutri West with each meal. One bottle of Diu-Plus will last for at least 10 days‚ depending on your dosage. Nutri West provides nutritional supplements to health care professionals in order to optimize their patients’ wellbeing. It was founded in 1981 and has expanded into a worldwide company with state-of-the-art‚ environmentally-friendly manufacturing and packaging processes. Its products are hypo-allergenic and have been formulated for the highest quality. 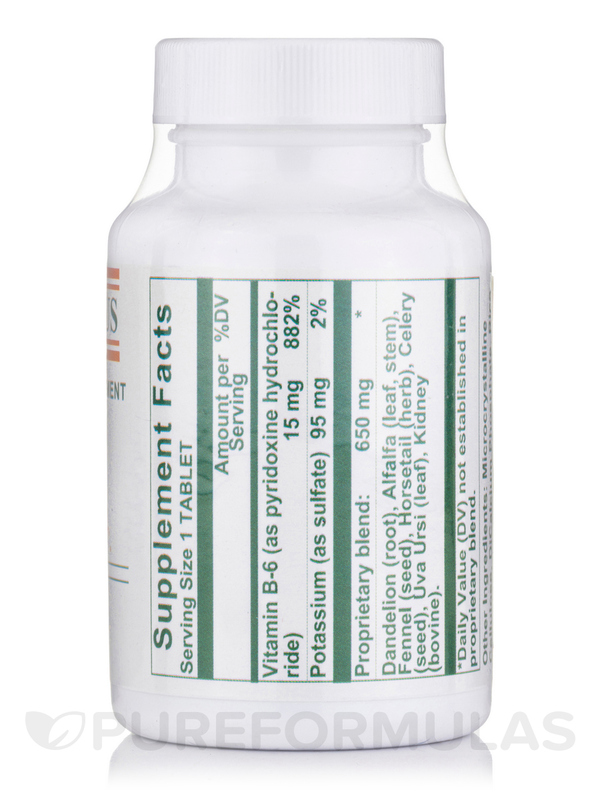 Natural Diuretic With Potassium Each Tablet Supplies: Dandelion (plant) 150mg‚ Alfalfa (leaf) 150mg‚ Fennel (seed) 100mg‚ Shave Grass (plant) 100mg‚ Celery (leaf/seed) 50mg‚ Uva Ursi (leaf) 50mg‚ Potassium (as sulfate) 50mg‚ Vitamin B-6 15mg‚ Kidney Concentrate 50mg. 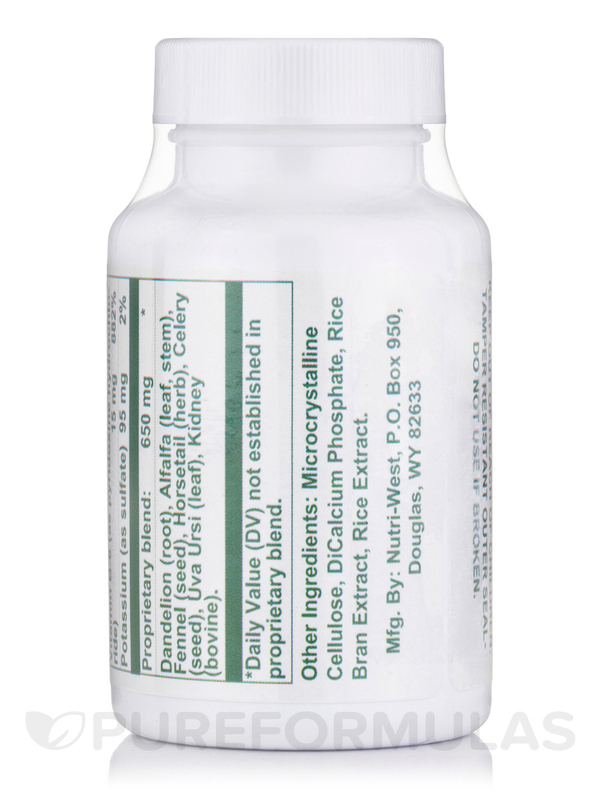 Alfalfa contains L-canavanine‚ suspected in some allergic reactions. I love this product. It helps to keep the right amount of potassium in my system. Something that seems to be missing from my diet. I just wish you could keep it in stock.